Wouldn't it be wonderful if Ken were able to produce this instrument at a price point around $5k? Once the evolution is near complete (I'm sure it will never stop all together) maybe he will tool up to do just that. Making such an instrument available to the non-investor, non-professional, guitar lover/hobbyist like me, would be a different calling but an admirable and rewarding one. Just think how it would be if those of us here never had access to the Fly? If it were just a guitar we read about in magazines? That would be a real shame. Thousands more understand, first hand, Ken's genius because they own one. Maybe Ken could hand make some models to satisfy those who can afford the $30k price and some models that are made in a production shop of sorts. I'm thinking out loud and the reality might be that Ken is tired of running such a production shop. Maybe he wants the peaceful solitude of working alone in his shop, listening to his favorite music while he carves plates. I understand this feeling as I used to make violins (hobbyist only). I worked with a profession, master violin maker here in Columbus (John Masters). I always thought that if money wasn't important, this is what I would do for a living. It's extremely rewarding work and good for your soul. I can't imagine doing it at Ken's level. Still, I want an Olive! 1. Guitars always seem to go up in value - at least the rare and beautiful do. In 1975, 58-60 Les Paul's were going for $5000. That was more than half my income at the time. Today, they can easily fetch $150,000 or more. And that's more than ALL my income. Wish I'd gotten an investment group together in 1975! 2. When it comes right down to it, how many guitars do you have (if you have many) that are not exceptionally popular in your collection? Meaning, how many get played rarely if at all? I am thinking it's maybe time to clean house and get one that I want to play and that WILL get played. As far as what Ken is up to, all I know is that he's building archtops and that he's very excited by what he's coming up with. I can't wait to see! I love your common sense approach to things. I feel exactly the same about having guitars that don't get played. Recently I have done a little house cleaning myself. Something that I have not really shared with the forum is that for a good number of years I have played mostly Flamenco guitar (along with some nylon Jazz). Not well but I love trying. About a year and a half ago I suffered a herniated disk that caused nerve damage in my neck. The motor control in my right hand was severely affected. It's a long story but the bottom line is that I can no longer play the finger-style/Flamenco that I once did. I almost gave up playing all together. But I decided to find a technique that I could play and make it my own. It's a process still in the works. One by one I've sold off Flamenco and Classical guitars that I loved but knew that I would never play them like I once did. Please don't feel sorry for me. The good news is that I discovered Flys, of which I now own two and love the new style I'm learning to play. This new way of playing has provoked me to learn more about music theory and in the long run I'll be a better player. I know I'm rambling but my point is that I agree with what I believe you're saying. I personally would rather own just a couple of really fine guitars that I play daily than a bunch that I play seldom or never. I just seems like a waste to me and that's why I've sold off everything I don't play anymore. Sorry for the wandering. This review of a Larry Coryell concert mentions he is using a Parker archtop. I knew it wasn't the Olive Branch. I was just interested to see a pro using the production archtop. The Eastmans are actually very cool. They're made in this little 8-man shop in Beijing. I'm suprised that US-Music even thinks they have a market for the instrument. 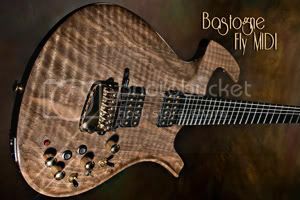 A friend of mine back home (www.brutonstringworks.com) could make me a custom jazz-box for that kind of money! I agree Jim, There is a ton of stuff available out there in that price range. These new guitars are about show, gold hardware, fancy inlays, bindings. All of the Parker acoustics completely miss the ideology and vision of the man whose name is on the guitar. Agreed, almost. The Parker pj12sb jazz guitar, by any standards, is an aesthetic nightmare bordering on the laughable. The pj14N, on the other hand is more minimalist and restrained - and as such more in keeping with the Ken Parker aesthetic. Where both miss out is the 'innovation within tradition factor' and as such the jazz guitars fall far short of even the more modestly priced Hofner Jazzica which has (as standard) the 24 frets many players crave as well as a well balanced acoustic signature thanks to some radical tapered body styling. Yeah sure, there's the pj24N if I pay even more. But my Jazzica already does that, so why would I splash out? I do have a black Parker 6E acoustic and it is superb in a traditional sort of way, it's not pushing any envelopes but you will not get a better sounding or more easily playing acoustic anywhere. Again, such a pity Parker skimped on the high frets (19??) 'cause this is exactly the guitar that would sound wonderful in an acoustic jazz context. So instead I have to dig out another acoustic instead if the Django mood hits me. All missed opportunities, alas.. Did nobody ever stop to consider exactly the type of musician who buys Parker? I have a Parker P40 (most likely one of the first to be bought in the UK). There' much to love about this guitar - the best part for me is the feel and playability of the fretboard. It also looks cool, but would look out of place in a jazz club. My preferred music is BeBop jazz as played by Joe Pass or Jimmy Bruno. I have a Washburn J-3 (a copy of the classic Gibson ES175 archtop jazz guitar), which I also love because of it's looks and it also plays superbly. Does the best of both worlds exist i.e. the P40 fretboard on a jazz archtop? The Parker archtops look so cool. Is it what I am looking for? Can they be purchased in the UK? How much might they cost? I have only ever seen 1 PJ12 for sale in the UK on Fleabay. I can't remember the price but it was affordable to me and I wish now I had gone for it, just for the rarity value of it. Never seen another.